...and with our holidays over we're back into our usual routine here. Mmm..maybe not quite. As soon as the A Level results are announced, the planning begins: only a few weeks until our girl starts her new life; and so we spent part of the weekend thinking about where she might live. I'd been a bit hesitant to suggest one of my places: who wants their Mum as their landlord? That's like having your Mum as your ..mum, but with added bills and possibly less hot water (memo: get the boiler serviced); but there's a good chance it'll work out (memo: suggest she takes some of her baking paraphernalia to fill all those cupboards, then I'll get my kitchen back and she can still be here with fresh brownie deliveries in about ten minutes). We'll see how much cleaning and painting goes on this week and take it from there. 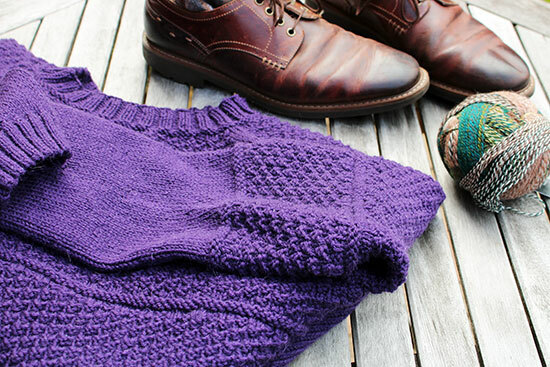 while I worked hard at not interfering, I kept busy finishing up the purple sweater I started at the end of June. It's the first bottom up, in-the-round one I've made; but I can see myself getting seriously obsessed with this technique. I've cast on another one already. I just need to backtrack a little and (very) swiftly decide on a plan for August's Sock Of the Month before I get going in earnest. This will be the winter of the yoke sweater. Autumnal coloured crazy Zauberball yarn to the right..maybe for socks? So, what did I do that was new this weekend? Apart from signing up a new tenant, not a lot. We did talk a lot about all the new things we had been doing the Sunday before..
...when I learned that driving an East German Trabant car (simulator only, folks, have no fear, I'm not on the road) is very hard work. How about you? Anything new? Maybe you'd like to make a memo and share. We'd love some new Mondayers! Deb, Helena, Eileen, Maggie, Fiona, Krafty Karen, Melissa, Mitra, Ladkyis and Barbara took some notes last week when I was away, and the week before. Give 'em a wave! And have a good week. My GOSH...you are amazing with your knitting!!! I really like that autumnal wool on the side there.... hope the accommodation issues work out well & I'd be certainly pushing for the baking stuff going where they'll be converted into YUMMY food!!! That purple wool is fantastic! Hmmm, 18 and having mum as your landlady ...? Oh that purple is gorgeous. 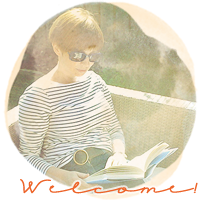 How do you feel about the imminent empty nest ..... or do you have secret plans! Gorgeous sweater in both pattern & colour. Having Mum as a landlady does have some merit, independence with connection close enough, just in case. OOOOOH...gorgeous sweater Sian! It's for you isn't it? I wish my DD lived 10 minutes away. I think I would bake for her everyday if she did but instead she had to go to Kent and fall in love!! Fun pictures of you in the Trabant! 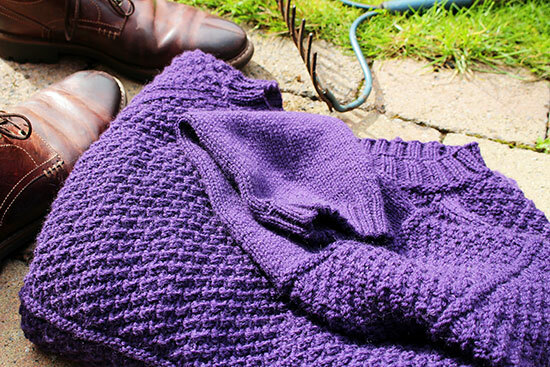 the jumper looks fabulous - a gorgeous shade of purple. I am sure you will work out the accommodation issues - when I first left home I would have loved to have lived close enough to pop by all the time. Love that new sweater--the pattern and the color! Might make the end of summer worth while! What a lovely sweater! Nice to "see" you back from vacation. I'm sure she'll be the perfect tenant! What an exciting time. That sweater is amazing, and all knitted in the round - wow! Whilst I bravely tackled socks on your say so, I'm not sure I could manage a much bigger project like that. It's beautiful, as is that rather lovely autumnal coloured ball of wood by its side. Your sweater is lovely---and the most gorgeous shade of purple. It's rich and regal looking. Can't wait to see a picture of you actually wearing it! Lovely jumper. Good luck to your daughter choosing her flat. I am sure mum would make a far better landlord than many. ( or are you a landlady? Somehow that gives me a vision of a middle aged lady in curlers and a headscarf! P.S. we rented from my parents for a few years and it was the best deal. I would come home to a dinner on the steps, my laundry would get done. Worked for all of us. They got a dogsitter when they went away. That sweater looks lovely and soft!